As a Christ-centered, college preparatory school, we rely on God’s provision through tax-deductible charitable contributions over and above tuition to sustain and enhance our programs and facilities. We are extremely thankful for the support of current and former Robert Toombs Christian Academy parents, alumni, grandparents, faculty, staff and friends in the community. We are grateful to you, our loyal supporters, for recognizing the value of Christian education in the lives of our children. Your time, talent, and financial contributions support our unique mission. While tuition funds a large portion of what it costs to educate our students, it does not fully cover everything it takes to build and run an exceptional school like RTCA. Every aspect of RTCA is impacted by your generous gifts—from our spiritual growth and character development opportunities, academic and co-curricular programs, to our campus and facilities. All are made possible through you. 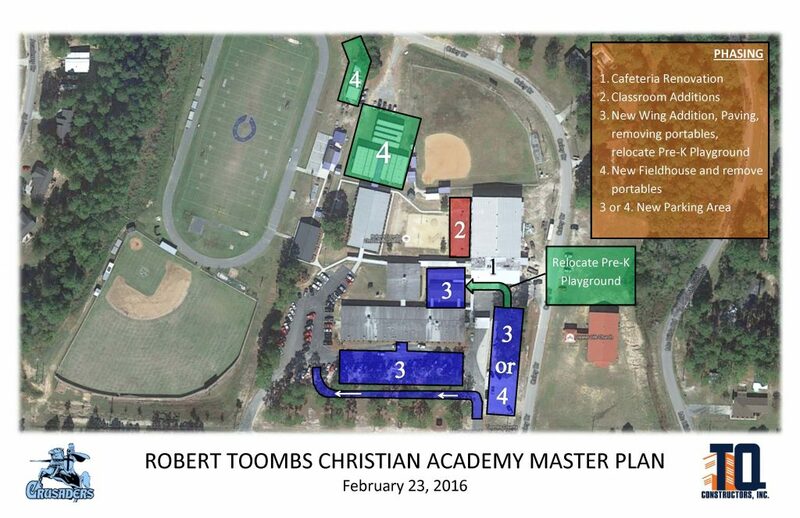 We invite you to explore the various ways you can support Robert Toombs Christian Academy. The new cafeteria is a 5,000 square foot facility that was built as an expansion to the Gymnasium, which broke ground in the summer of 2015. The renovation included a completely new and larger kitchen, larger cafeteria eating area and new roof. The facility also includes new restrooms located at the entrance of the cafeteria. The new classroom addition is a 3600 square foot facility that was built adjacent to the Gymnasium. The new building broke ground in May of 2015. It includes four classrooms and houses our middle school classes.